My story began in December 1999, when I was young and healthy, and I had already completed 7 Marathons and numerous triathlons. The night before I was scheduled for a routine mammogram, I found an unusual small hard lump in the space between my breasts, but sort of to the right. Since I had NO family history of breast cancer, I thought maybe it was just a bone that I hadn’t noticed before. Unfortunately, it turned out to be early stage Breast Cancer – Ductal Carcinoma In Situ. The biopsy later showed that in my particular case, the cancer cells were *aggressive* and had I not been diagnosed and treated early, I might not be here today to talk about it. Because the margins around my first specimen were disputably small, we opted for a second lumpectomy to make sure that we got out all of the bad cells. I then underwent 6 weeks of radiation therapy, followed by 5 years of Tamoxifen therapy. I have been cancer free ever since, and have finished dozens more Marathons and triathlons in the past 18 years. So now you know why raising money to search for a cure for Breast Cancer research is so important. About 85% of breast cancers occur in women who have NO family history and no gene for breast cancer. Healthy, athletic people with NO family history can and do get Breast Cancer. I did. Why donate to the Breast Cancer Research Foundation? The Breast Cancer Research Foundation (BCRF) is the top-rated Breast Cancer charity in the USA. According to Charity Navigator.org, 90% of BCRF’s budget goes directly to support Breast Cancer research programs. To see why BCRF is tops in the rankings, go to CharityNavigator.org. Please use this link – https://give.bcrfcure.org/Ellen2018Pinkathon – to make a tax-deductible donation in ANY amount to support the Breast Cancer Research Foundation. 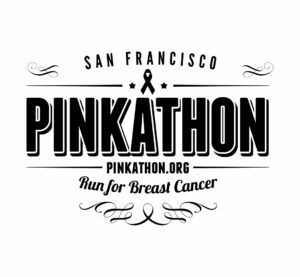 This link is for my personal fundraising page as a member of the Pinkathon San Francisco team. 100% of your donation goes directly to the charity. 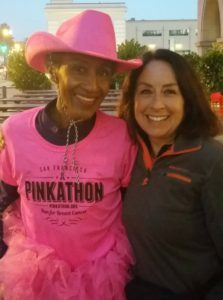 The Pinkathon San Francisco does not touch a penny of it. The reason to use this link is so that the Pinkathon SF and I can see exactly how much money we raised.